Here's another geometrical object that, if you believed basic school textbooks, should be impossible. You know how they taught you that carbon only comes in three forms, diamond, graphite and soot, and that other configurations were geometrically impossible? Before the penny dropped regarding Buckyballs and Buckytubes? Well, it turns out that even diamond has (at least) two possible versions. This one is known as hexagonal diamond, or Lonsdaleite, after the crystallographer Kathleen Lonsdale (1903-1971). Hexagonal diamond is a bit of a wildcard, in that although we can try to calculate and model the properties of the bulk material, we don't really know for certain what they are, exactly. We expect pure Lonsdaleite to be harder than standard diamond (which is interesting), and it it might well have interesting semiconductor properties when we dope it (as with normal diamond), but until we can find or make a decent-sized chunk of the stuff to test, we don't know for sure. 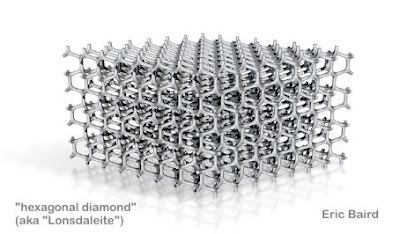 What we could do is try to make hexagonal diamond using conventional chemical vapour deposition (CVD), but to use some sort of crystal seed surface that has bumps and hollows in the right places to get the Lonsdaleite structure started, after which the deposited film will hopefully continue growing in the new "HexD" configuration. But it's maybe not immediately obvious why Lonsdaleite doesn't usually get noticed in normal diamond-bearing rock. Does it have some form of instability that makes it a less viable end-material than conventional "cubic" diamond? Dunno. One potential clue is Lonsdaleite's structural affinity to graphite. You can (notionally) make Lonsdaleite by taking stacked and aligned sheets of graphite and cross-linking. Graphite's two-dimensional sheets only make three out of the four potential bonds per atom, the missing fourth bond being shared as a sort of pair of fuzzy electron clouds that hover on both sides of each individual graphene sheet, as a sort of repulsive lubricant that lets the individual graphene sheets slide across each other. Looking at the hexagonal structure of a single graphene sheet, we can select alternating carbon atoms (three per hexagon), and force them down out of the plane to make bonds with the corresponding atoms on the sheet below … and then take the other 50% of the atoms in the sheet and make them form similar shared bonds with the atoms directly above them, in the next sheet up. The sheet then crinkles so that it's no longer flat, and hopefully, in the right set of circumstances, the sheets on either side will start to crinkle to fit, and their spare three-bond atoms will be pushed out of the plane to be closer to the next sheets, and will hopefully start to make bonds. But perhaps chemical vapour deposition is the way to go, if we can find a suitable seed substrate. * Okay, somebody's now bought one though my Shapeways shop, so that makes three. :) There must be other physical models of this thing out there, in chemistry labs somewhere ... I've just not seen one photographed. Then again, I'm not a chemist or a crystallographer.